It’s been a hot minute since I’ve written anything. Being a full-time wife, mother, student, small business owner, and NILA is just exhausting sometimes. Instead of giving lame or irrelevant content, I decided to wait and continue to share my previous posts which are still highly relevant. That being said, I wanted to share my thoughts on a topic that I am passionate about. It is a topic that I preach in our concealed carry courses (all of our courses really, especially our ladies only courses). It is a concept that I am so passionate about that I end up getting a lot of pushback and I miss out on a lot of collaborations with other companies because of it. It is my soapbox if you will. When people ask me if I’ve served in the military or if I am a law enforcement officer my snarky reply is always “Nope! I’m just this awesome all by myself”. While I say that tongue-in-cheek it’s my way of spreading the word that an average-civilian-mother-avid-Pinterest-lover type woman can be a badass too! Please pardon my French, it’s really the only word that describes the level of ninja that a mother can become. I’ve had the opportunity to shoot with military guys, law enforcement guys, SWAT guys, and have outshot my fair share of them by simply being willing to learn. I wrote another post called The Mama Bear Instinct that touches on this topic as well. Many women don’t understand what they’re capable of if they push past the fear of the tool and the fear of the training and the fear of failing. Mama’s, I want you to go to the uncomfortable place in your mind for a moment. Let’s say you’re going grocery shopping with your littles, they’re sitting in the cart asking every question they can think of. You turn around for half a second to read a label on a cereal box (after all, we’re trying to cut out processed sugar where we can) and when you turn around to see why your kiddo is being so quiet you see a large man walking off with your child. Question: what would you do? Would you pull your gun? Yell? Run after him? This is why training is so crucial! You shouldn’t have to think about your reaction. You should already have a pre-determined course of action for this very event. This is why we, especially as mothers and fathers, must go to that SCARY PLACE and play the “what if” game. If you carry a firearm period, how long would it take you to draw it? Here is a VIDEO on drawing your firearm that you can practice at home. If you carry in your purse, you have to get your purse from under your groceries, open the pocket, disengage any locking mechanisms, take the firearm out of the holster, THEN you can go after your child! Friends, that’s way too long. Now, I’m not saying that purse carry is bad. I tend to rate methods of carrying on a good-better-best scale, it’s just good…there are so many better ways to carry. Someone who is highly skilled and trained, capable of executing a mission (operating) that is sensitive in nature and time, with little to no supervision. Now, based on that interpretation, show me how a parent, especially a mother, can’t be an operator? Does this definition say anything about military or law enforcement? A mother can take the time and pay the money to get highly skilled and capable of executing a mission to protect her kids. This is my point exactly. 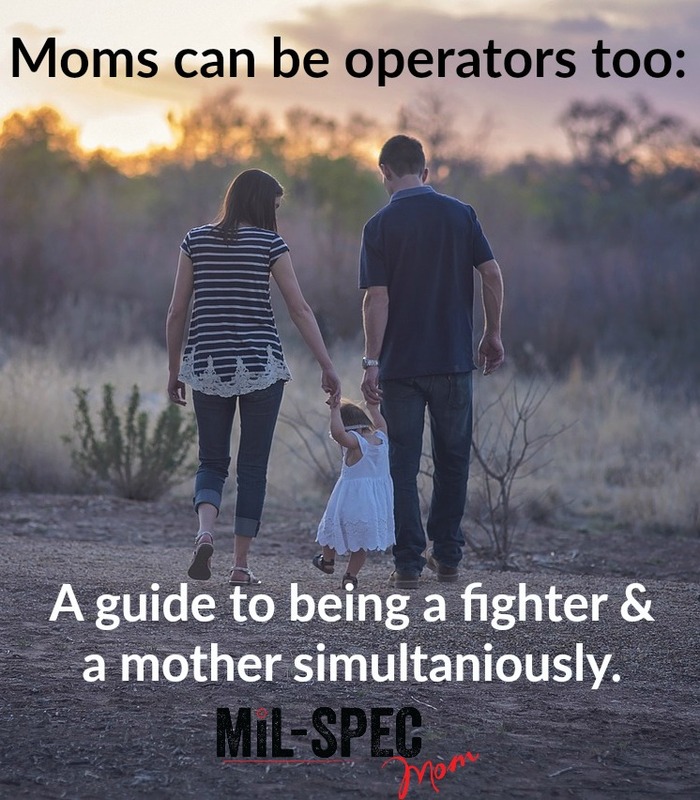 There is no reason that we, as mothers, can’t have the skills, equipment, training, and mindset of an operator. Over the last 5 years I have taken over a dozen courses and spent thousands of dollars on these courses, on equipment, on ammo, and gear to get the skill set to make me a hard target to potential threats. It also makes me much more capable to defend my children from situations much like the grocery store scenario that we spoke about earlier. So how do we become operators? Let’s go over a few things that can get on your way. Take training courses. Gaining training is going to be one of your greatest assets. Taking training courses will help you hone your mindset and your situational awareness skills. It will also aid in your marksmanship and technique with your firearm. Play the “what if” game everywhere you go. This will also help sharpen your mindset and situational awareness skills. By playing this game, and thinking like a threat, you will be able to identify potential threats and take steps to mitigate those steps even while doing typical parent tasks like grocery shopping, taking the kids for a bike ride, or watching your kids play at the local city park. You must be ON all the time. Yes, it’s exhausting and it’s emotional, but it can give you a tactical advantage that can save your life, and the life if your family. Spend the money. Trust me when I say that this is difficult. I grew up in a modest family and was a single mother for a few years. I get that money can be tight and budgeting for a course doesn’t always take priority over bills and putting food on the table. However, there are times where sacrifices need to be made and money needs to be set aside for the betterment of your family. Remember, we don’t live in the world we did when we were kids; where we came home when the street lights came on, and we walked miles to and from school, and we spent the night at random friend’s houses. We don’t live in that world anymore. Safety is a concern these days and then there are more horrible people in the world who want to ruin people’s lives for no reason. I recommend taking at least one course every 6 months or so. Obviously, the more the better, but being a mother myself I get that schedules don’t always work out and an 8-hour course gets expensive with gear, ammo, and babysitters. Push past the fear. Taking a course in something new can be scary! Especially in the gun industry, it can be daunting to be a female in this very male-dominated world. In all my courses I’ve been the only female in all but 2 of them. Yes, it’s awkward and uncomfortable at times. But I have never regretted what I’ve learned in those courses. I bet you won’t either. HERE are some tips for finding a good instructor. Here is another article I wrote about being prepared on a deeper level. Use the equipment that the real operators use. Here is where I get frowned upon. There is no reason that you can’t carry a Kydex holster on your waistline like the operators do. If we look at professional shooters, ie- law enforcement, military, private contractors (like the guys from 13 hours) we see a pattern. They carry a firearm on their waistline; not on their belly, not in their bra, not in their purse/murse/bag, not even appendix carry. They carry at their 3 o’clock or 4 o’clock if they’re right-handed and 9 o’clock or 8 o’clock if they’re left-handed. I realize there are some operators who carry their handgun on their chest plates [body armor], but that’s not a huge occurrence. We also see operators using Kydex holsters; not sticky, not belly bands, not neoprene, not leather; simply Kydex holsters which are one of the only holsters that have a proper trigger guard that prevents anything like a pen, tampon, keys, or toy from getting into the trigger well and causing a negligent discharge. I say it in my courses, and I’ll say it here: It is almost negligent to carry a firearm anywhere but in a Kydex holster. Parents, you CAN be a ninja and protect your kids by getting the skills, training, and proper equipment. If you’re ever in doubt, look at the professionals (ie- law enforcement, military, private contractors) and see what they do. Emulate them and become an operator for the betterment of your family.